Blackberry, the global leader on wireless innovation on Wednesday, March 6, 2013 officially debuts Blackberry Z10, the first smartphone powered by BB 10 platform in the Philippines. Price for this re-engineered device costs P29,990 and confirmed to be available also on Smart, Globe and Sun. 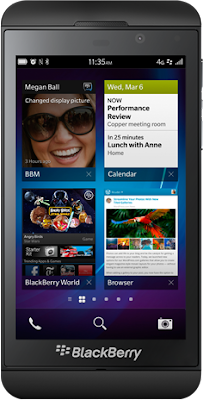 Blackberry Z10 is almost here! Those who wait for it's official release may now reserve unit starting today. The device will be available on March 19, 2013 as reported. "Year 2013 is the 10th year since BlackBerry smartphones were first officially introduced here. And today, we're bringing the BlackBerry Z10 in the Philippines in black and white," said Cameron Vernest, country director of BlackBerry Philippines. The excitement of tech followers and Blackberry users creates buzz on social media today. Blackberry Z10 trended on micro-blogging site, Twitter. The BB Z10 smartphone features a 1.5 Ghz dual core processor with 2GB of RAM, 16GB of internal storage, and an expandable memory card slot that supports up to 64GB cards. The all-touch screen phone has 1280 x 768 pixels of resolution on 4.2-inch display. The smartphone also includes the latest enhancements in high density pixel and screen technology to display clear, sharp, and incredibly vivid images. It features a micro HDMI out port for presentations, and advanced sensors such NFC (near field communications) to support mobile payments and the exchange of information with a tap of the smartphone. 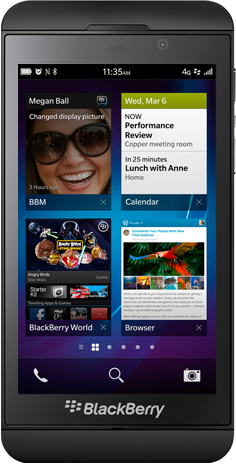 Another feature of the Z10 is the BlackBerry Flow, which enables features and apps to flow seamlessly together. "For example, you can tap on an attendee listed for a meeting to see their latest tweet or their LinkedIn profile. Or tap the thumbnail of a picture you just took to launch the Picture editor and quickly apply a transformation or filter, then instantly share it with your contacts," Salvo, business Manager of BB Philippines said. It is also confirmed that the new device supports 4G LTE technology. Good thing is, we already have a wide network coverage of the latest evolution as of BBZ10 launch in the Philippines.